ADVISORY: SCPA CEO Jim Newsome discusses U.S.-China Trade War on CNBC Squawk Box (ASIA) – watch here. U.S. Foreign-Trade Zones (FTZs) provide a secure and profitable platform to compete effectively in domestic and global markets. The FTZ program is available to all U.S. based importers/exporters and can be established at warehouses/distribution centers and manufacturing facilities. 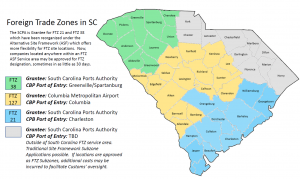 South Carolina FTZs are administered under the FTZ Board’s “Alternative Site Framework” (ASF). 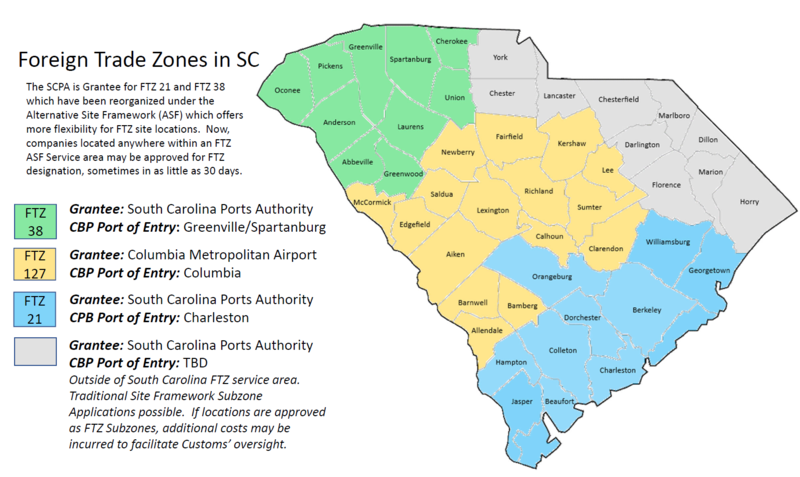 SCPA is the administrator (grantee) for two Foreign-Trade Zones in South Carolina: FTZ 21 along the coast and FTZ 38 in the Upstate. SCPA works closely with the Richland-Lexington Airport District-Columbia Metropolitan Airport, the administrator (grantee) for FTZ 127 in the Midlands region. The ASF greatly expedites and streamlines the process required of all South Carolina importers to access the benefits provided by FTZ status. The ASF will lower costs and facilitate more rapid entry into the FTZ program for participating companies doing business in South Carolina, saving them considerable time and resources by eliminating much of the required application and subsequent approvals process. Warehousing and distribution companies can expect to receive FTZ designation in 30 days and manufacturing and production companies can expect to receive the designation in 120 days. Companies located in counties not included in the approved service areas are eligible to apply for FTZ status under a different framework as a subzone. For more information, please visit the links below, or call (843) 577-8161. Will an FTZ work for your company? © 2019 South Carolina Ports Authority. All Rights Reserved.